The Center of Excellence in Wireless and Information Technology (CEWIT) hosted a 43-hour weekend interdisciplinary student hackathon at CEWIT’s research and educational facility over the weekend. 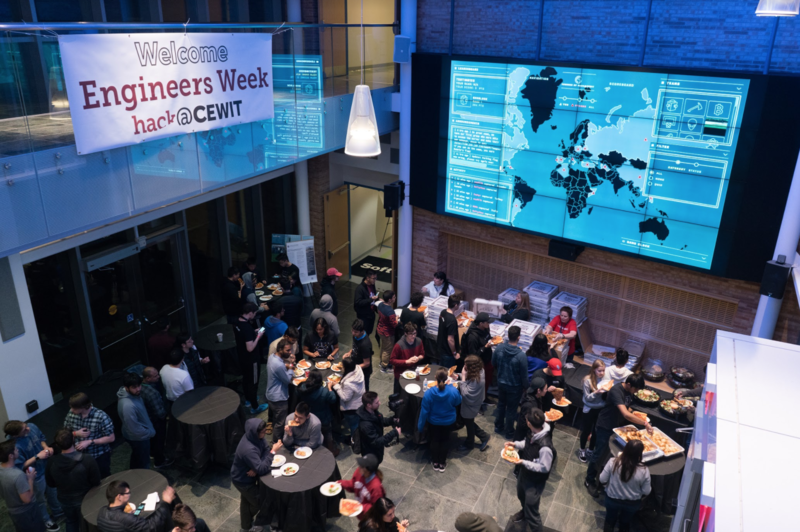 Hack@CEWIT 2018: IoT & Security, the second annual event of its kind, gathered around 150 students from across the country and abroad to code programs, solve challenges and showcase applications while attending workshops and tech talks over the span of three days. Although the name may suggest otherwise, Satya Sharma, executive director of CEWIT, said hackathons have nothing to do with computer crime. Instead, the collaborative events allow competitors to develop software and hardware projects under a tight deadline. On Friday, the first day of the event, Matthew Cordaro, a software engineer at CEWIT and one of the organizers of the hackathon, explained what the hackathon is about. “I’m expecting people to leave here knowing something that they didn’t know before, whether it’s something they wanted to learn or something completely unexpected that they found out that they were good at,” Cordaro said. Manpreet Singh and Rahul Sondhi, both sophomore computer science majors, said they wanted to make a health-focused Android app during the hackathon. Sondhi explained that he wanted the app to have a virtual character that levels up as the phone’s owner inputs actual health data like steps and calories. “We’re not entirely sure yet how we’re going to set it up, but we’re planning on using some Amazon APIs,” Singh said, referring to the application programming tools called the application programming interface. Signs of progress were showing on the second day. The team split the work up into three parts, including interface, pedometer and barcode scanner for recording calories. Senior computer science major Eifu Tomita said the hackathon can be a good environment to work on schoolwork while attempting challenges and attending workshops. Around 40 mentors were around to help students with different skill sets they might need to learn on the spot including new programming languages, software and hardware. Elizabeth Gilmartin, one of the mentors and a clinical data analyst from Northwell Health, New York State’s largest health care provider, said the company brought two challenges, each with a $1,000 cash prize, including one asking students to find a way to predict patients’ no-show probability to their appointment based on patient metadata. A group of four called Codenza, named after an Android app with more than 200,000 downloads that the team leader Divyendra Patil built prior to the hackathon, won the Major League Hacking finalist award and the No. 1 position in the capture the flag ethical hacking competition. Codenza group members Rahul Yadav, Sagar Jain and Poornima Pundir came from the Stevens Institute of Technology in New Jersey, and worked on a low-cost way of predicting Parkinson’s disease using machine learning technology with key-logging data and cameras recording hand-movements on a keyboard. Using the data from PhysioNet and the key-logger that classifies how long computer keys were pressed, the latency time from the first key press to the second and hand movements recorded by a camera helped them detect possible symptoms of Parkinson’s disease such as movement restrictions, Yadav said. Singh and Sondhi finished the health app they wanted to make at the beginning of the hackathon and demoed it to the judges. They said they were going to keep developing the app after the hackathon ends. Cordaro said the hackathon was a good environment for students to be creative and try new things.